Heat oven to 325°F. Spray 12x8-inch (2-quart) baking dish with nonstick cooking spray. Cook ziti to desired doneness as directed on package. Drain. Meanwhile, in large skillet, cook ground beef and onion over medium-high heat for 8 to 10 minutes or until ground beef is thoroughly cooked and onion is tender, stirring occasionally. Add tomatoes, tomato sauce, salt and cinnamon; mix well. Bring to a boil. Reduce heat to medium; cook 10 minutes or until mixture is thickened and thoroughly heated. Meanwhile, melt margarine in medium saucepan over medium heat. Stir in flour; cook until mixture is smooth and bubbly. Gradually add half-and-half, stirring constantly until mixture boils and thickens. Remove from heat. Beat egg in medium bowl. Slowly add about half of flour mixture, stirring constantly. Return egg and flour mixture to saucepan. Add 1/2 cup of the cheese; stir to blend well. Add cooked ziti to beef mixture in skillet; mix well. Layer half of ziti mixture in sprayed baking dish. Sprinkle with 1/2 cup of the cheese. Top with remaining ziti mixture. Spoon white sauce over ziti mixture. Sprinkle with remaining 1/2 cup cheese. Bake at 325°F. for 25 to 30 minutes or until bubbly around edges, center is set and cheese is browned. Sprinkle lightly with nutmeg. Let stand 10 minutes before serving. To serve, cut into squares. 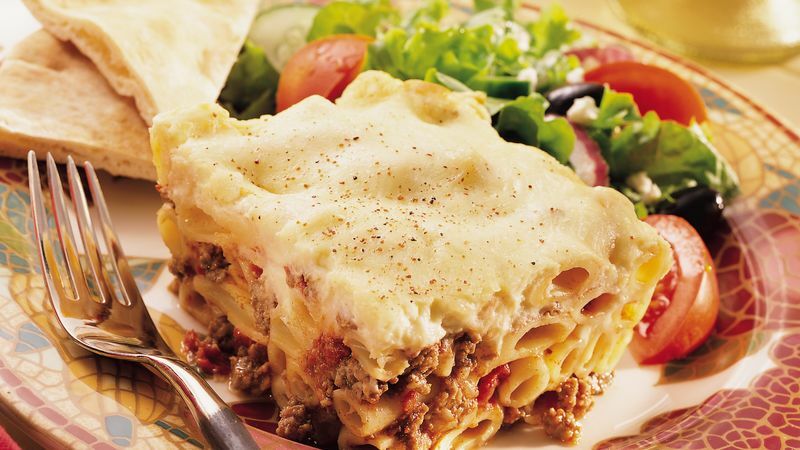 Pastitsio is a classic Greek casserole made with layers of long, thick tubular pasta, ground lamb or beef seasoned with tomato and cinnamon and grated cheese. The crowning layer is a thick topping of bechamel sauce, a rich custardy white sauce. Try using kasseri in place of the Parmesan in this casserole. Kasseri is a Greek cheese made from sheep's or goat's milk. It is one of the ingredients in the traditional, brandy-flamed Greek recipe, saganaki. Kaseri has a sharp, fill flavor and hard texture that makes it perfect for grating and adding to pasta recipes. Serve this flavorful pasta dish with a traditional Greek salad made with tomato, cucumber and onion tossed with kalamata olives and feta cheese. Dress the salad with olive oil and red wine vinaigrette, and top it with a generous sprinkling of crushed dried oregano.